In 1942, after four years with The Tommy Dorsey Orchestra, Buddy Rich was already considered “The World’s Greatest Drummer.” Soon afterwards, he wanted to develop some music reading skills, so he began to study with renowned drum teacher Henry Adler. Ironically, he never learned, due to his busy touring schedule. It didn’t make a difference; Buddy Rich was a one of a kind genius with a photographic memory. He could hear a song just once, and memorize it completely. When Buddy sat behind the drums, pure instinct took over. The following quote from drummer Ted MacKenzie sums up Buddy’s relationship with Henry Adler in the 1940’s. Adler was keenly aware of the importance in documenting Buddy’s style and technique. This quickly evolved into a collaborative book effort between the two, “Buddy Rich's Modern Interpretation of Snare Drum Rudiments.” Over seventy years have passed since it was first published, and it is still considered the Bible of Drumming. The Rich-Adler method became the standard for all drum books to follow. While Buddy went on to greater fame, Henry Adler continued teaching the Rich-Adler method in his New York Studio. In 1969, drummer Ted MacKenzie began to study with him. There, Ted also learned additional techniques from jazz drummers, Jim Chapin and Sonny Igoe. In the mid 1990’s, Ted Mackenzie and Henry Adler met once again. 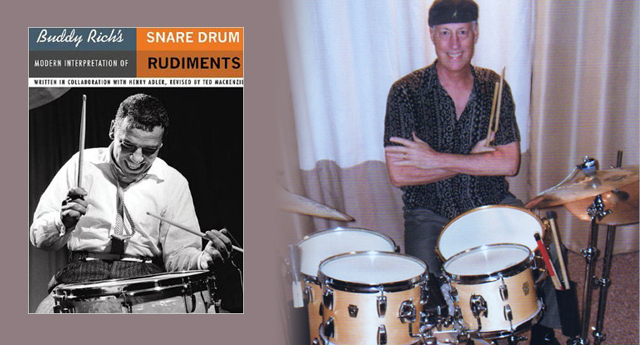 They teamed up to revise the original 1942 edition of “Modern Interpretation of Snare Drum Rudiments.” Adler came out of retirement specifically to work on this essential project. Both agreed it was long overdue. In 2005, the updated version of Buddy’s book was released to critical acclaim. Buddy Rich’s, bible of drumming, is now more relevant for the 21st Century. It became inevitable that Ted would write a sequel expanding on the earlier Rich - Adler concepts. This book is titled “Buddy Rich’s Rudiments Around The Kit” and is available at Amazon, Barnes & Noble and on Ebay. Ted MacKenzie’s great skill as both a musician and artist contributes heavily to his teaching methods. Numerous illustrations showing Buddy’s grip technique and hand positions were all drawn by Ted. He also designed and demonstrated the correct rudimental hand and finger positions in photographic form. Ted’s book is the definitive reference on Buddy. The Rich-Adler method allows the rudiments to be adapted to any drum set configuration in an infinite number of ways. In addition to MacKenzie’s method books, he also developed “The Ultimate Drummer's Workout.” His “Wag the Brush” technique, uses brushes to exercise the wrists, hands, and fingers. This helps to quickly improve speed, strength, and endurance. All of Ted’s teaching materials are meant to work together as a cohesive unit for maximum results. Looking back to 1919, we saw 18 month old Bernard “Buddy” Rich, amaze audiences, known then as, “Traps The Drum Wonder.” Even at this very young age, it was more than obvious he was destined for ultimate greatness. If Adler had not fully documented Buddy’s style and technique, it may have been lost to the ages. For this, we owe Henry Adler a huge debt of gratitude. Ted MacKenzie continues that storied tradition by optimistically moving forward. He is hopeful that every new generation of drummers will embrace the Rich-Adler method. In doing so, we will keep Buddy Rich’s great legacy alive forever.